For many years the Association of the Holy Family in Erie, PA has participated in an annual fundraiser picnic in Pittsburgh. The proceeds benefit the Sisters of the Holy Family of Nazareth’s schools in the Philippines. For a variety of reasons, it was decided to suspend the summer picnic. However, the Associates still felt the desire to support the children in the Philippines and conducted a raffle at St. Stanislaus Church in Erie. Through the generosity of its members and the Sisters, the Associates were able to put together three beautiful theme baskets: one summer fun, one electronics and one fall. Through our efforts and with the support of parishioners, we were able to raise $618 which will be sent to the Philippines in time for the Christmas holidays. We appreciate all the Sisters have done for the Associates in Erie and are committed to carrying on their mission of serving families and children. The Association of the Holy Family nurtures the spirituality of lay individuals who have dedicated themselves to living Nazareth spirituality in their families, in their workplace and in the world. These women and men help advance the mission and ministry of our Congregation through faithful listening, loving relationships and recognizing God’s presence in their daily encounters. If you are interested in exploring how to join our Associates in spreading the kingdom of God’s love, please visit Become an Associate. 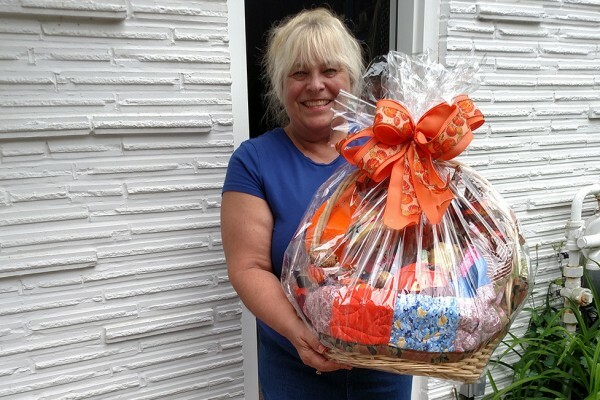 Pictured is Bonnie Beatty, winner of the fall basket.